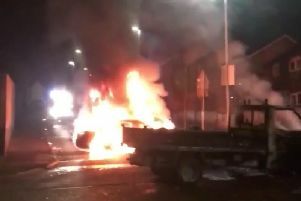 A fire at a premises in the Gransha Hospital site in Derry during which a man was rescued and treated for smoke inhalation was started deliberately, the Fire & Rescue Service have confirmed. Staff at the facility immediately implemented evacuation procedures as two Fire & Rescue appliances were dispatched from Crescent Link Station after a call about the blaze was received at 6.13pm on Tuesday night. A Fire & Rescue spokesperson said: “Firefighters were called to an incident involving a fire in a first floor bedroom of the hospital. “A man in his 50s was removed from the room and treated for smoke inhalation at the scene by hospital staff. “The building was evacuated before the arrival of fire crews. Firefighters wearing breathing apparatus extinguished the fire. The cause of the fire has been determined as deliberate. A Western Health and Social Care Trust spokesperson meanwhile confirmed: “There was a small fire at a facility on the Gransha Park site yesterday evening. “Staff at the facility commenced the evacuation process immediately, following their fire training guidelines. PSNI detective Detective Inspector McStravick said: “It was reported that there was a fire in one of the rooms in the building. Enquiries are continuing and at this stage. The Fire & Rescue Service said the incident was dealt with by 6.52pm.